1 Combine the basil in with the pine nuts, pulse a few times in a food processor. (If you are using walnuts instead of pine nuts and they are not already chopped, pulse them a few times first, before adding the basil.) Add the garlic, pulse a few times more. 2 Slowly add the olive oil in a constant stream while the food processor is on. Stop to scrape down the sides of the food processor with a rubber spatula. Add the grated cheese and pulse again until blended. Add a pinch of salt and freshly ground black pepper to taste. 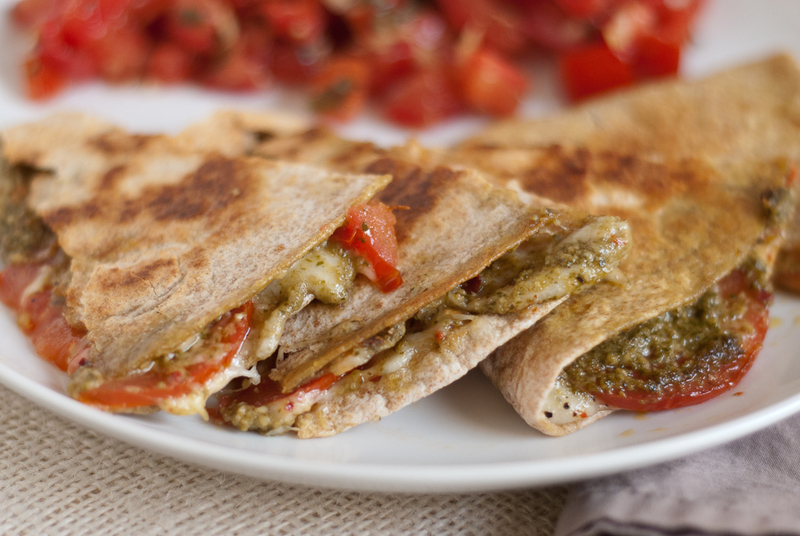 Pesto quesadilla (above) take one: pesto, tomato and mozzarella between a whole wheat quesadilla. Pesto pasta with extra protein: Toss steamed, shelled edamame, lightly sautéed spinach (optional) and whole wheat rotini in pesto. The buttery texture of edamame complements pesto surprisingly well. Pesto tortilla pizza: Top an organic whole wheat tortilla with pesto, reduced fat mozzarella and sliced tomatoes. Bake at 450 degrees Fahrenheit, preferably on a baking rack, until the cheese is golden and bubbling. Pesto scrambled eggs: cook your scrambled eggs as usual and take the pan off the burner once the eggs are mostly set. Stir in pesto and top with Parmesan and diced tomatoes. Pesto popcorn: stove top popcorn lightly tossed with pesto and grated Parmesan (optional). Pesto grilled cheese: layer pesto, mozzarella, and roasted red peppers or tomatoes on good whole wheat bread. Grill. Amazing! Arugula pesto pizza bagel: Top a 100% whole wheat bagel with pesto, mozzarella pearls and cherry tomatoes. Bake at 450 degrees Fahrenheit for about ten minutes, until the cheese is melted. Let the bagels cool slightly and top with arugula that has been lightly tossed in lemon juice, salt and pepper. Avocado pesto pasta: This might not be the prettiest pasta around, but it sure is tasty. Combine roughly equal parts avocado and pesto in your food processor. Add a squeeze of lemon juice. Blend thoroughly. Drizzle in extra olive oil if necessary. If you’re feeling adventurous, blend in some goat cheese, too. Toss with whole wheat pasta. 194 calories, 2.9 grams sugar, 2.8 grams fat, 39.3 grams carbohydrates, 6.3 grams proteinWheat berries are nutrient powerhouses loaded with protein, fiber, iron, and more, making this salad-in-a-jar recipe a particularly nourishing meal! Mixing the dense and chewy grains with apples and dried cranberries offers a winning sweet and savory combination. A light lemon and vinegar dressing helps keep the calorie count down too! Mix all salad ingredients in a bowl and set aside. Whisk the lemon juice, balsamic vinegar, and olive oil until well combined. Toss with salad. 1. Preheat oven to 375 degrees Fahrenheit. Lightly coat an 8 x 8 baking dish with nonstick spray. 2. In a small bowl, combine berries, sugar and cornstarch. Set aside. 3. In a large bowl, combine flour, oats, brown sugar, baking powder and salt. Add egg, vanilla and cold butter, using your fingers to work the butter into the dry ingredients until it resembles coarse crumbs. 4. Spread 2/3 of the batter into the prepared baking dish. Spread berry mixture evenly over the bottom layer. Sprinkle with remaining 1/3 of the batter and turbinado sugar. 5. Place into oven and bake until golden brown, about 25-30 minutes. Let cool slightly before cutting into bars. We’re going to be experimenting this ourselves, and here’s a great link for following along at home. You can make do with a coffee grinder and a mixer — so give it a shot! I just made granola with the wheat berries and it was awesome! We heated them on the stove top to soften them up then added them in our traditional granola. Great for added crunch and they were something I had never heard of before, thanks! I’m so glad you enjoyed them! I have been making cereal with the wheat berries every morning. 1/2 Wheat Berries, 1/2 old fashioned rolled oats cooked in twice the amount of water. I add milk, honey and dried fruits. The breakfast keeps me going through lunch, it’s another nice way to use them.